Man, superheroes have gone through the wringer lately. 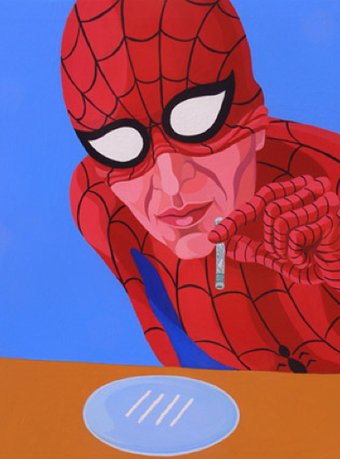 First, Italian artist Giuseppe Veneziano opened a controversial show that features superheroes behaving badly. Also, Kevin Smith wrote an in-canon comic of Batman peeing his pants. Yes, you read that right. First off, Giuseppe Veneziano has been causing a stir with his recent pop art show in Pietrasanta, Italy. Granted, the hubbub has been over a painting of a baby Hitler cuddling up with the Virgin Mary, but his portrayals of superheroes have been none too flattering. Think Catwoman-Batman-Robin threesomes. ...and that Smith makes Batman piss himself. Mind you, the above bladder spasm occurs in a scene in Frank Miller and David Mazzucchelli's seminal Batman: Year One. That's like going back to Fantastic Four 1 and rewriting Mr. Fantastic emerging from his downed spaceship waggling an eight-yard erection. You just don't do it. I've been waiting eight years for Smith's second issue of Daredevil/Bullseye: The Target. I think I can wait a little longer.